In order to exploit Ninh Thuan’s tourism potential. We, the Long Thuan Trading& Construction Company, constructed the Long Thuaän Resort on the Ninh Chu Beach one of the most beautiful beaches in Vietnam. 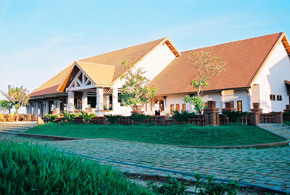 We paid attention to every detail in the resort’s design to make Long Thuận uniquely attractive and cozy. The eight hectare resort has 24 sea-view bungalows, 36 garden-view deluxe rooms and 128 garden-view standard rooms all are amazingly and exclusively decorated with luxurious western architecture to meet the needs of the frequent travelers. In addition to the luxurious bungalows, there is a comfortable 500-seat restaurant facing to the white sandy beach especially serving for parties, weddings and summit conference and seminars. 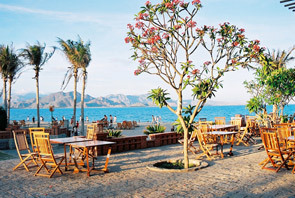 A 300-seat restaurant with fresh sea-food for those who come to the resort on the specific purpose. An open-air terrace closed by is designed to set up any barbecue, buffet parties, or any dancing and musical performance. Besides, the 5 private sea-view dining rooms with semi verandah pampering the aristocratic taste of the gourmets and lodging travellers. The conference hall and the Business center are designed exclusively to meet all the summit demands with the high-technology and up-dated equipments. The Fitness center and 2 connected tennis courts are available for those who are active tuning boby at our fully equipped exercise room. There is a completely beautiful long white sandy beach, where you can warm up yourselves such as jogging along or soaking your body in swimming pool with warm freshwater or in the fresh sea, curving close along as the green-belt of the resort. The supporting services like Massage, Tennis, Sea-sport activities, Bar and Fire-camping, Karaoke… are also provided with high and state-the-art equipments to offer entirely safety. Souvenir shops with home products and specialty from Cham villages are available to offer travellers some unique fine arts and handicrafts which reflects the beautiful ancient culture. 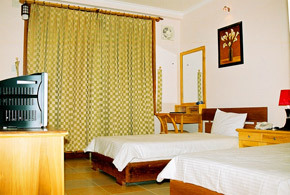 At the resort, we do not only provide our travellers with superior services but also enjoyable experience with our resort’s pleasantly unique and arrangement. 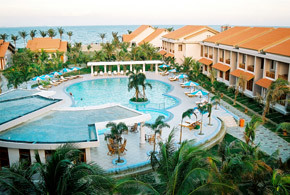 With forest dominating the picturesque landscape, the bright, clear sea and an impressive poetic seaside of Ninh Chu beach, the wonderful Resort will certainly be an ideal place for travellers to enjoy the uniqueness of the nature.